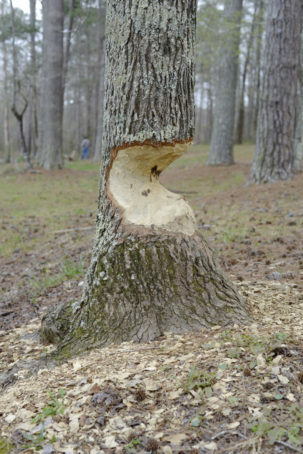 Beaver work – they love Sweetgum trees, at Hidden Acres. Join us for a special walk in DeKalb County’s Hidden Acres Park, one of the Atlanta-area greenspaces inducted into the Old Growth Forest Network last year. Most trees are not as large as those found in some older forested areas, but there is an unusually high diversity of trees and native plants, indicating old growth soils are still intact, and the original, native forest is growing back. One area along the tributary of Crooked Creek may be one of the largest, last refuges for fresh water mussels in the Georgia Piedmont. Water in low lying areas is an important feature of this park, which hosts a stream, lake and extensive wetlands, much of it managed by beaver. So we think this will be a great habitat for amphibians! 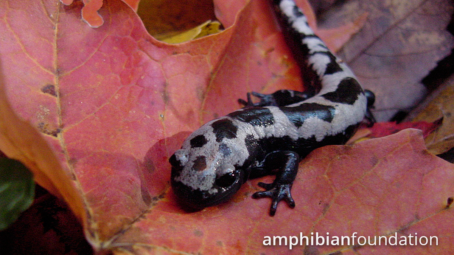 Salamanders in fact put the Southeastern US at the top of the global biodiversity chart, leading the world in the number of different salamander species. Perhaps that’s because our native ecosystem is much older and richer than other parts of the US, and indeed much of the world. We’ll walk about 1-1.5 miles on natural trails, on a few slopes but mostly on flat areas, and we may do a little walking off trail in wet places. To register (RSVP) click HERE – details and directions sent to registered participants. A donation of $15 or more helps support our programs. Mark Mandica is the Executive Director of The Amphibian Foundation, a non-profit organization dedicated to the study and conservation of amphibians. His work puts him on the front line in the efforts to conserve declining native and tropical amphibians. He received his B.S. from UMass where his thesis focused on the ephemeral wetland ecology of amphibians. He then went on to the American Museum of Natural History in NY where he worked as a Curatorial Assistant before moving to South Florida for graduate school at UMiami. During the course of his studies, it became increasingly difficult to simply find amphibians outdoors, and as a result, he has joined fellow scientists and naturalists to address the global amphibian decline crisis. Before founding the Amphibian Foundation in 2016, he managed the amphibian conservation program at the Atlanta Botanical Garden. Mark is also a professional scientific illustrator with works published in textbooks as well as the journals Science, Nature, Journal of Experimental Biology, Zoology, American Zoologist and many others. 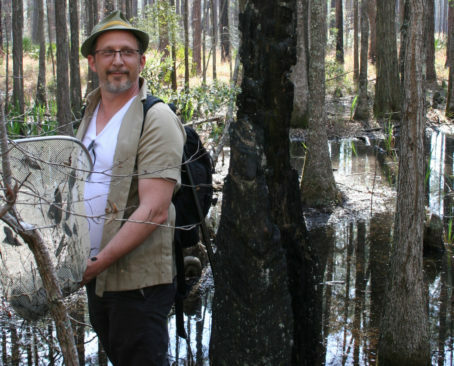 Mark now dedicates the majority of his time towards conservation efforts aimed at reversing amphibian declines in the southeast US and abroad, and teaching amphibian biology, ecology and conservation at Agnes Scott College in Decatur, GA.